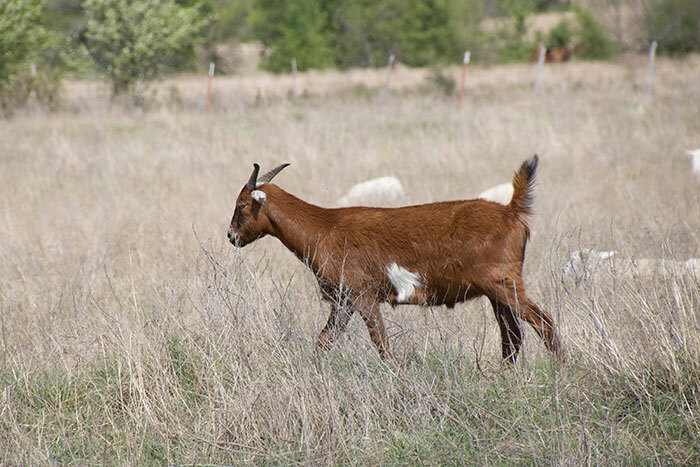 Producers looking to add sheep or goats to a traditionally cattle-grazed pasture will most likely require reinforced fencing. Cook notes that while producers with the typical five-wire barbwire fencing will struggle to contain smaller ruminants, they can easily be upgraded by adding new strands of hot wire. He adds that barbwire on exterior fences often needs to be changed to net wire fencing, especially when it comes to goats. “Areas with high densities of browse seem to be more conducive to adding a hot wire to the existing fence, while areas with sparse stands of browse and a few forbs might require net wire fencing,” Cook says. “Sheep could require less fence modification than goats, but sheep may or may not meet the manager’s goals, especially when it comes to brush suppression,” he adds. From gaps between rails to animals turning around in wide alleys, Cook points out that most ranches are not well adapted to working smaller animals through facilities. Producers interviewed indicated that a separate set of pens may be needed to work sheep and goats. In addition, differing treatments and pharmaceuticals are required to care for sheep and goats, requiring a new skillset of the farm manager. Sheep and goats often require more attention and care than cattle. To that point, Cook mentions that the smaller hooves don’t wear down as quickly and may require more trimming, adding to labor and expenses. Because sheep and goats are often targeted by predators, producers are recommended to keep guard animals to ensure their safety. Regardless of animal type, this is an added cost that must be taken into account when determining if grazing more defenseless animals works in an operation, Cook warns. While Cook notes that donkeys and llamas are frequently used, he feels that a good guard dog is most effective at keeping predators at bay. “Having multiple dogs could be key as it may be trial and error to discover which individual dog will be most conducive for different management styles and needs,” Cook says. “Finding a veterinarian who has experience with sheep or goats could be an issue in certain areas. These animals have different diseases, parasites, and other health issues to deal with than cattle,” Cook says. As with anything else, Cook advises weighing the advantages and disadvantages of a multispecies grazing system. However, he notes that many producers have seen added biodiversity, offsetting the costs and pains of caring for additional species. In the end, Cook believes that the most beneficial advice on the matter comes from discussing these challenges with neighbors who have already worked through them.